One of the little-known facts about the Tom Swift Jr. series is the fact that it spawned its own activity book. This activity book, which was created by Tony Tallarico in 1978, is quite hard to find; in fact, mint copies of this book usually commands prices of $60 or more. Why is a mere activity book so highly valued? Well, I think that there are two reasons. 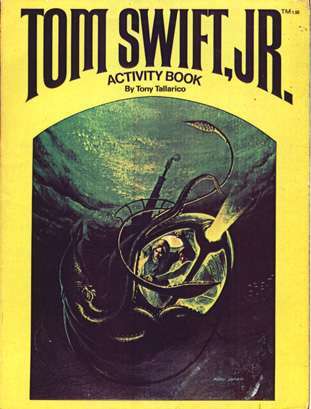 First, very few copies of this book were published -- the Tom Swift series was nearly dead, and somehow the activity book just wasn't selling well. Second, if people mailed the cover -- yes, just the cover -- of this activity book to the publisher, people could get a rebate on other series. books. This policy, as one might imagine, resulted in the destruction of a large number of copies of this book. Actually, it is the TOM SWIFT JR. ACTIVITY BOOK (Elephant Books (Grosset & Dunlap), 1978). It was created by Tony Tallarico, the illustrator of the 1977 Tom Swift paperbacks. According to a note I received from him several years ago, several of the illustrations were going to be used for an illustrated catalog of G&D series books. Tony Tallarico (aka Anthony Tallarico) also created coloring books and activity books for the Hardy Boys, Nancy Drew, and Bobbsey Twins. In recent years he has created a series of books similar to the WHERE'S WALDO? books.